Just had another trip to Edinburgh. This was a pre-booked visit to see my mum, but if you have been reading my blog, you will know she died in early March. So we had two full days in the beautiful city of Edinburgh to relax and enjoy what Edinburgh has to offer. Two things-to-do were planned in the days before setting off to Dublin for our flight to Edinburgh. 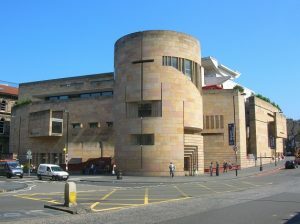 A favourite attraction for me is the National Museum of Scotland in Chamber’s Street and that was put on the agenda. Picking inside locations fitted with the weather forecast, which was possibly snow! Another event chosen was more of a touristy venue, the Edinburgh Gin Distillery that is amazingly slap bang in the city centre. We booked this online for the day after our arrival. You may be thinking at this point that I’ve run out of things to say on moisture and turned my blog into a travelogue. Not so, it was at the Edinburgh Gin Distillery that the subject of moisture jumped out at me, but not directly…. Before I get into my gin and moisture connection, I did not post on my blog last week. 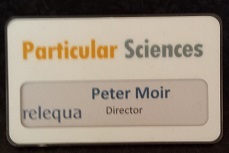 My excuse is that I was presenting at a seminar and workshop in Dublin on the subject of moisture in powders. I did try to write some words on my Edinburgh trip which happened on the previous weekend. Usually I prefer to strike whilst the iron is hot and write just after an idea pops into my head. In this case it would have been straight after returning from the Edinburgh Gin Distillery. However, I wanted to give the new information I was presenting on moisture at the seminar my best shot. Squeezing what I had to say into my allotted time was tough. After several practice runs I managed to get my talk into 25 minutes. When preparing for an important talk, the words keep circulating round my head and writing for my blog had to take second place. Holding the workshop part of the meeting in Dublin was much more relaxed and informal. Using my self-taught knowledge of relative humidity I explained how this works on a few slides. This Information on relative humidity is the same as Chapter 1 of my eBook “A Wet Look At Climate Change”. Following that I moved onto a demonstration of moisture being taken up very quickly by some tablets. And finished by showing off our new instrument for moisture testing developed in our company Relequa Analytical Systems. Back to the Edinburgh trip, but before “gin and moisture”, I’m off to the National Museum of Scotland. My mum took me to this museum from an early age. By the time I got to my teenage years I knew my way around “Chamber’s Street” museum, as we called it, and this was probably a big influence in me doing science as a career. Now I go to the same museum, although it’s much changed inside, and usually come away inspired by at least one exhibit. In this visit to “Chamber’s Street” I went into the space exploration exhibit. Immediately in front of me was an Orrery that I remember from my early years. This particular Orrery in “Chamber’s Street” shows our solar system and the positions of eight planets inside a large clear sphere with the relative positons of the constellations as we see them from Earth. The reason I mention this Orrery is that I remember the mechanical action of the planets moving around the sun. But now a sign says that the gears have worn out. Fair enough, it was built in 1913! Just a bit of trivia in that Pluto was not discovered until 1930 so is not part of the Orrery, but because Pluto got downgraded to a “dwarf planet” in 2005, the Orrery has the correct number of planets. These days in “Chamber’s Street” I find myself heading first for the exhibit celebrating great Scottish inventions and innovations. It’s just on the left hand side as you come up the stairs from the entrance. What I’ve always liked and find inspirational in my approach to science is the 18th and 19th century scientists and engineers. During this period of history people were making important discoveries before chemistry and physics became widely known as disciplines. If you wanted to do an experiment and you didn’t have the equipment, you built it yourself! Real science at a fundamental level. On this visit to “Chamber’s Street” I picked up on Joseph Black, an 18th century physician and chemist. He discovered carbon dioxide, a gas that I think most people will have heard of in its role as a “Greenhouse” gas and global warming. Two fundamental discoveries made by Joseph Black were “latent heat” and “specific heat”. We would need to get into the subject of “Thermodynamics” to understand these two concepts. Unfortunately thermodynamics was never, and is still not, one of my strong points. To give you a hint of what “latent heat” might be, Joseph Black wondered about, and then worked out an explanation to what happens to the “heat” in water as it gets to boiling point and turns into steam. Boiling water, steam and include a bit of alcohol, links us right back to the Edinburgh Gin Distillery tour. Going through a low door that you have to duck to get under, takes you into a narrow room with two stills. One is a “gin still” with a large bulbous head at the top for infusing botanicals to add extra flavour. 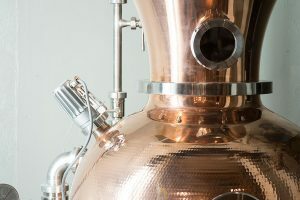 The other is a still for recovering alcohol from the parts of the gin distillation that are not added to the clarified gin. I loved seeing these magnificent copper instruments up close. Gin distillation is part art and part science. A Head Distiller oversees this crucial part of gin manufacture to give each batch its distinctive flavour. Many ingredients are used by the Edinburgh Gin Distillery, and I’m not going to give away any details of that part of the tour. As an event that takes over an hour from heading down the “dark” stairs to the “gin den” until when you leave, it is inexpensive and worth booking up for. But the key ingredient that must be present, is juniper berries, otherwise it can’t be called gin. Finally, I’m getting to “gin and moisture”. Last autumn there was a news scare that we were going to run out of gin! 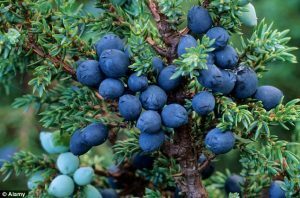 “Will juniper blight put G&T at risk? Drink under threat as fungal disease attacks berries in Scotland” Living in Ireland, blight is something that everybody knows the human consequences of, although not many people know that it is a sort of fungus. The great famine of the mid-19th century caused by blight attacking the potato crop devastated the Irish population. I’ve written often on this blog about the relationship between moisture and fungus and included a chapter on blight in my eBook. So, when our tour guide, James I think he was called, mentioned this scare story, I, of course, instantly tuned into what was coming next. As it turns out, the juniper berries used by the Edinburgh Gin Distillery are not Scottish. Maybe a little bit disappointing to learn that with being in Edinburgh, Scotland’s capital city, that the key ingredient is not local to Scotland. But on the other hand, delighted that Edinburgh gin is not under threat of drying up. 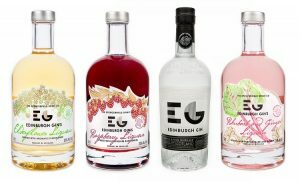 Edinburgh Gin Distillery gets their juniper berries from Bulgaria and many of the other ingredients from all around the world. Bulgaria perhaps does not get prolonged spells of damp “Scottish Weather” needed to keep the relative humidity high enough for long enough for fungal growth. To finish on high, almost literally, at the end of the tour you get an option of having a gin. Again, I’m not going to give anything away about this part of the tour. But I will say that the setting of where the gin was served, how it was served and the taste, has got to be the most delicious gin I’ve ever had! This entry was posted in My Moisture Technical and tagged Blight, Chamber's Street Museum, Edinburgh, Gin Distillery, Juniper, Moisture on May 4, 2016 by PeterMoir.